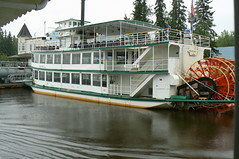 One of the most popular tourist attractions in Fairbanks, Alaska is the Discovery Sternwheeler boat, docked on the Chena River not far from downtown. It is owned by the Binkley family, who have been in the riverboat business since the days of the Klondike gold rush. It has been a tourist attraction since 1950 and has been continuously captained by members of the Binkley family. The Alaskan gold rush lured thousands to Skagway, which became known as the gateway to the goldfields. By 1898, it was Alaska’s largest town with a population of about 20,000, not counting the 10,000 people living in the tent city of nearby Dyea. Today, Skagway has less than 1,000 residents but the population more than doubles on the days when the cruise ships pull into the dock. Skagway boasted the shortest route to the Klondike, but it was far from being the easiest. Over a hundred years ago, the White Pass route through the coast mountains and the shorter, but steeper, Chilkoot Trail, were used by thousands of stampeders. The treacherous Chilkoot Trail, combined with the area’s cruel elements, left scores dead. The hotels, saloons, dance halls and gambling houses prospered, but as the gold supply dwindled, so did the population of the town, as the miners left to go to newly-discovered gold fields. I was amazed at the size of the big white ship docked at Vancouver, B.C. We had flown in and were ready to board for our 7-day cruise through the famous Alaskan Inside Passage. Traveling with two other couples, we had mini-suites with balconies side by side on the Dolphin Deck, Deck 9. For most people, a trip on an ocean liner is not something they would consider. It takes longer to get places that way and delays arrival at a destination. Since The Queen Mary is now docked in Long Beach, California, the Queen Mary Hotel can provide an approximation of what it would have been like to travel the Atlantic in style. We had been invited to spend time with the Queen, the ship the Queen Mary, that is. Docked permanently in Long Beach, California, the cruise liner Queen Mary saw many years of active service until it reached its current permanent berth. Now a hotel, tourist attraction and historical museum, the Queen is a venerable ship that first plied the waters in the time just before World War II. The passenger capacity was almost 2,000, with the crew representing a little more than half that number.